Solo: A Star Wars Story: Tour The Millennium Falcon with Lando! Solo: A Star Wars Story opens on My 25th. Lucasfilm Releases Nine (9!) Character Posters for Solo: A Star Wars Story! Lucasfilm has released a set of character posters for Solo: A Star Wars Story – encompassing the nine featured characters in the film. They’re a powerful reminder of how thoroughly the Star Wars movies have impacted our pop culture – check out the star-studded cast in their Solo: A Star Wars Story roles below. Solo: A Star Wars Story opens on May 25th. That Reckoning Is Here Trailer: Westworld: Season Two! Westworld Season 2 – Dolores (Evan Rachel Wood) and Teddy (James Marsden) – Photo by John P. Johnson/Courtesy of HBO. While Dolores begins to build a world for the hosts, we get our first real looks at Shogun World in the new trailer for HBO’s Westworld. Westworld returns on Sunday, April 22nd (9/8C). This Beautiful World… Deserves To Die Trailer: Westworld: Season 2! HBO ran a trailer for Westworld: Season 2 during Super Bowl LII – and looked at the world of Westworld from the point of view of Dolores. Westworld returns on April 22nd. Run, Fatboy, Run: An Exercise in Clichés! 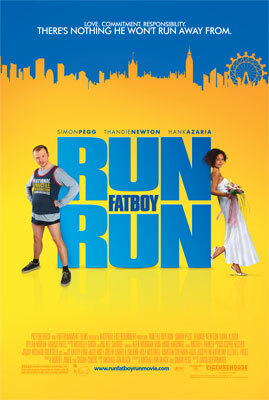 Apparently, even Simon Pegg’s rewriting of a Michael Ian Black script wasn’t enough to keep Run, Fatboy, Run from becoming a mash-up of romantic comedy and sports movie clichés. This is not quite one of the worst movies of the year. There are major spoilers in this review – because, well, I can’t see the point in not mentioning them. They’re clichés!